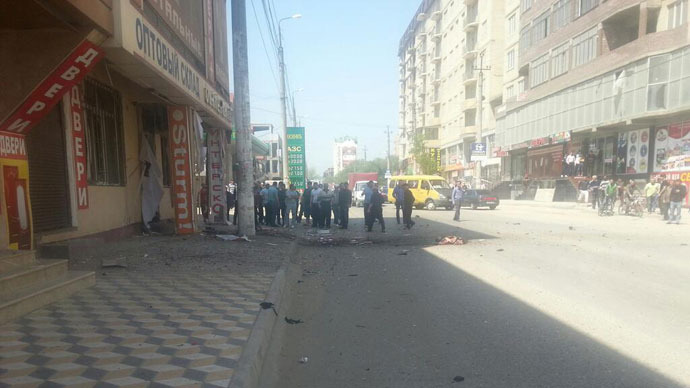 Two people have been killed by an explosion near a shopping center in the Russian city of Makhachkala, Dagestan. Two people are injured. Police say the bomb was packed into a box or a bag and two teenagers were killed as they tried to uncover the dangerous object. The two injured are their friends, also teenagers. One of them was reported as dying in hospital, but Dagestani police later denied this, saying both are alive. The blast took place shortly after midday local time near a local market and a shopping center. "Preliminarily, we believe it was a piece of metal pipe with explosives inside equal to approximately 2kg of TNT," RIA-Novosti quotes a police source as saying. Police are investigating information that the object that later exploded had been thrown at the entrance of the shopping center from a passing car. "The bomb went off a few meters away from my store," eyewitness Magomed Nuradinov told RT. "I came a few minutes after the explosion, I saw two dead bodies lying on the ground. Only when the police came did we realize they were children of around 12 years old. They were the ones to open the box and be blown up." It's not the first time somebody has planted explosives at that same place, Nuradinov went on saying. Back in January a similar suspicious box was found, but at that time people from the nearby store called for the police. Explosives equal to 1kg of TNT were in that box. Nuradinov believes somebody is trying to assassinate some shop owners.